1. It’s kind of a mixed message to say you’re against a bus lane in your neighborhood but you’re for mass transit. 1b. I’m weary of hearing the “but it will cause traffic” argument being used against every conceivable project in L.A., including the building of mass transit. Yawn. 2. I wish the conversation about a downtown L.A. football stadium near transit was a conversation about a downtown L.A. baseball stadium near transit. 2a. Anyone saying that a downtown stadium would be a traffic killer has never driven — a verb I use with irony — to a football game at the Coliseum or a Bruce Springsteen concert at the Sports Arena. 2b. When the Regional Connector is built, there will be frequent trains to Long Beach, Santa Monica, East Los Angeles, Azusa and Union Station stopping just a couple blocks from L.A. Live, Staples Center and the Convention Center. 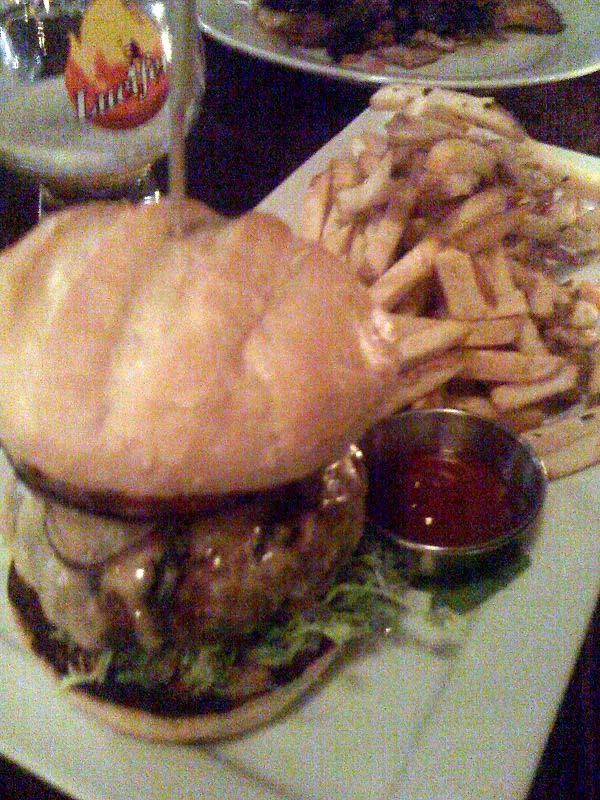 The Umami burger, as captured in low light by my iPhone. •Encourage private firms to invest in high-speed rail projects to close the funding gaps that otherwise can’t be filled. •Continue the planning process on most of the lines in order to prevent them from stalling and dying. Those aren’t necessarily bad goals — but it’s not the same as having lines up and running in the next six years. Then again, the interstate highway system wasn’t built overnight either. 4. I think if there’s one stat that Congress thinks long and hard about when writing the next – federal transportation spending bill, it’s the one that Sirinya put in her post yesterday about federal funding: 56 percent of all Americans are living in the nation’s top 50 metro areas. I hope that’s where 56 percent of transpo money goes. 5. On the Metro Dining Map front, I finally had my first Umami burger — the one on Cahuenga and a short walk from the Hollywood/Highland Red Line stop. I know there are lot of people who have said it’s the best burger in town — and it was quite tasty — but I still rate Father’s Office (Santa Monica and Culver City), Comme Ca (WeHo) and the Pugburger at Hungry Cat (Hollywood, Santa Barbara) as better. 5b. If you’re in the Bay Area, don’t miss the burger at the Farley Bar at the Cavallo Point lodge in the Golden Gate National Recreation Area. It’s on the north side of the Golden Gate Bridge — the easiest way to get there is to drive, unfortunately — but it’s worth it and the views from outside of the city are stunning, too. Thanks Joel! I’ll put both those places on my list! I’ve been thinking this, too. It would make much more sense to build a baseball station next to the Convention Center and LA Live, because baseball plays many more games, in a longer season, compared to football. Would the Dodgers consider moving Downtown to a fancy new stadium, in exchange for a new football stadium being built in Chavez Ravine? Football fans can “tailgate” to their heart’s content in the huge parking lots (which already exist), and the lack of good transit connections won’t matter for only 8 games a year. I also thought about that.. New dodger stadium downtown with its 81 home dates. That would pump some money in the downtown core.. And yes, nfl stadium where dodger stadium is now.. The good folks of elysian park would not face 81 days of traffic, good trade down to 10-20 or whatever they can use it for. Ucla should also seriouly consider moving there… then, i thought some kind of sky bucket from chinatown gold line station up the hill to the new station.. Good tourist ride on non-game days. Build some kind of walk way or overlook on the edge of the south facing parking lot (behind where home plate is now) would be like griffith park, only closer to downtown. Outdoor restaurant etc. I wish the conversation about a football stadium in Downtown was a conversation about almost anything else in Downtown. A stadium, which we already have one of in Downtown, is not exactly a compact land use. In the place of one stadium, you can build hundreds of medium-sized businesses and residential units. It’s a gigantic trip generator, which means traffic no matter *where* you put it… so putting it where that traffic will impact a much larger number of people just doesn’t make any sense. One enormous venue in Downtown is plenty. Let’s build an Americana in Downtown, instead! Are you suggesting that AEG pays to extend the Regional Connector a few blocks to have a station close to LA Live, etc…? In fact the Regional Connector, as it’s currently designed, will feed directly into the current Blue Line & Expo Line tracks and thus the existing Pico station, which is just a block from Staples and L.A. Live. Here’s a pretty good photo that shows how the four legs will meet up. I’m not as rabid about this question as some people, but people are still curious why you don’t use the Gold Line to commute from South Pasadena to Metro HQ. If speedy light rail and a destination that is essentially in the transportation hub of LA is not attracted to take transit, what hope is there to attract the rest of LA? Has anyone considered how the Pico Blue Line station will be able to handle large crowds of people going to a football game, or even the larger number of people that may use it to attend a current event in the area when the Regional Connector is built? The platform is tiny – obviously done on the cheap – and cannot handle large crowds. To expand the capacity of the station you would either need to build a new platform on the east side of the tracks, where a walkway and a building are now, or build a new platform on the west side of the tracks where Flower St is and divert Flower St through the existing surface parking lot. Another example of Metro building rapid transit lines with no expectation that people would actually use them. I’m a huge fan of Father’s Office and hope to check out Umami soon. Thanks for the frequent and diverse posts. I’ll keep visiting the site several times per day. If Pico station (it should be named LA live or Staples center) reaches capacity or beyond, it will certainly be a good sign for LA transit, and potentially that many less single occupancy autos. However, I also too see a problem with the surface LRT stations in terms of their ability to handle large amounts of people as they are currently designed. It may become necessary to add under/over passes as walkways to the stations from the sidewalks with expected large volumes. Sure it would cost just a bit, but then again, its something that will most likely become necessary in the near future to accommodate expanding ridership safely and efficiently. I think that sort of thing needs to be considered. And not only are the current platforms small but the pathways to get to them are small too, not to mention that one must cross the tracks. While that may be simple with current passenger loads, it could become very cluttered which would be potentially very dangerous when a train is approaching the station. It ought to be pointed out that Father’s Office (both locations) is an over-age-21-only establishment. The full name of the station is Pico/Chick Hearn, not that LA Metro has altered all signs or announcements to reflect this. Not only for the points you have made, but also for the flow of pedestrians to/from the many parking “facilities” that lie on the other side of the Blue Line from Staples will the station need a total rebuild. I’m also going to chime in and say that Metro needs to seriously start thinking about Pico/Chick Hearn Station improvements being added to the Regional Connector project. I have seen that platform for Laker’s Games and it is just an accident waiting to happen. My dream would be to create a fully grade separated station (either above or below) which will probably not happen but something is going to have to be done, and even may have to add doors to the station to ensure passengers don’t fall on the tracks if metro is going to do the improvements on the cheap and keep the current “skinny” platform. So you want to build some fake pedestrian area with tons of parking when you have very good pedestrian areas already in DTLA close to transit?